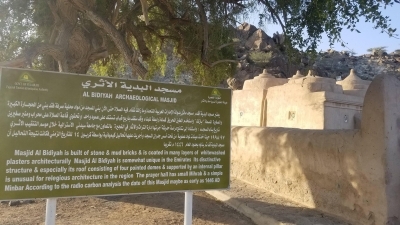 Al Bidya Mosque is part of the Tentative list of UAE in order to qualify for inclusion in the World Heritage List. I only like religious buildings for the architecture and Al Bidya is cute. It's a bit far off from Dubai but I drove a large circle around the country and the extra hours plus beach time was all right. Shoes off, head scarf on, here we go. Most of the tourists are Indian do they prefer selfies out front but people do come in to pray - I waited for them to finish (both the prayers and the “selfie-ers”). First thing you will notice the 4 domes on the roof. If that's not unique enough then the pillar holding this all together, that's some fancy design. The decorations on the walls gives the interior enough light. It's really tiny so don't expect much time inside, maybe 5 minutes tops to see it from all angles. I didn't find the roof decorations special and the minbar and mihrab are obviously still in use and worn out. You can then ascend to a guard tower out back, with a good view of the coast, again mainly for selfies. You can also see the roof from up here much better. It's a shame the origins of the mosque are so unclear. I also think the guard tower has been redone and lacks authenticity. It still looks imposing as a background to the mosque. Entrance was free which I usually expect for a house of worship but isn't much of a case these days, and parking outside is enough for the amount of visitors it gets. The documentation also talks about petroglyphs but I couldn't see any. It started getting dark so I didn't spend much time on the rocks behind the mosque so maybe it's actually there, but same goes for the ruin walls, it's hard to tell. The mosque should be the main focus anyhow. Pro tip: most rental car agencies limit mileage per day, ensure you have unlimited because this adds quite a few extra KMs on the meter.